I'm pleased to say I finally got the chance to play with my fabric yesterday. Just over two years ago I started making these little Christmas Gifts and have been using them in my displays ever since. I started making some more a few months ago and really thought I would have finished them by now. So this is what I did yesterday. They are lots of fun. Very little stitching, raw edges are the go and gluing is permitted. The object - To make as many as you can in the shortest time possible. Once I've chosen the fabric (sometimes this takes longer than expected), they take about an hour to make. I didn't tell you the most exciting thing that happened during the week. It rained. My rain gauge showed 43 mm. This is the most rain we have had since July and was very welcome as we are on Stage 4 Water restrictions. My garden was looking extremely dry with many plants beginning to struggle and this will keep them going for just a bit longer. I haven't finished mulching so at least now I'll be mulching moist ground instead of dust. The roses are a mass of beautiful blooms, but this is more likely due to plant stress than anything I've been doing. Still no sewing but I did play with my card patterns. I've found some matching envelopes and have been repackaging them. Don't they look gorgeous. The patterns alone would make a lovely gift. This one is called For You Pillow. There is nothing nicer than making a gift for someone special. But more often than not I find myself with less and less time to do the things I would like to do. And sadly this applies to my hand made gifts. So I'm always aiming to make something divine in the shortest time possible. 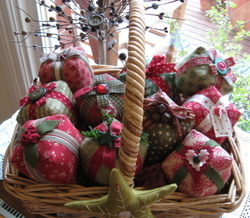 This little pillow can be made in an afternoon and with some lavender popped inside makes a beautiful scented gift. This is the For You gift Pouch. 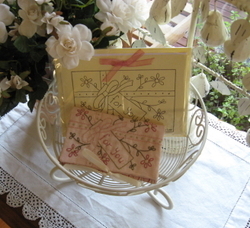 There is a little pocket inside to place that special gift. 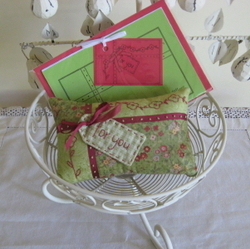 Needles, buttons, old lace, or a hand written note expressing how special that person is to you. Yes the roses in the photo are fake and when I think of all the beautiful blooms in the garden. How bad is that! I wish I could say that I'd been playing with my fabrics and threads all week but the truth is the only time I've picked up a needle was to sew down the last few centimetres of binding on the quilt just finished. All I've been doing is getting myself organised for the workshops I'm going to in November which involves writing a couple of new patterns for some little projects I made the past two Christmas's. I'm not going to be happy if I don't get to sew something soon. But at least it's been giving my arm and shoulder a rest which must be good. I had to ring Carolyn today and I know I turned a shade of green when she told me that yesterday she made a quilt from start to finish - yes that's cutting, sewing, quilting and binding it. 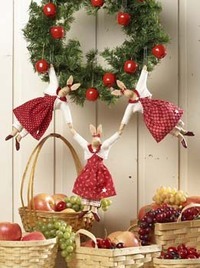 It does seem a way off but I've also been thinking about Christmas and what I' d like to make for decorations and gifts. Last year I was having trouble remembering what I'd made or purchased the previous year let alone 2 or 3 years before that. You think you'll remember but you don't. So I covered a notebook and on each page I have the persons name with the year and brief description of the gift. Of course, I just couldn't make any old cover. It had to be decorative as well as functional. If you would like the chance to win a copy of this and the Saint Nick needle punch pattern please post a comment by 31 October (next Wednesday) to enter the draw. I just love the texture of needle punch and it is surprisingly quick and easy to do once you've got the hang of it. 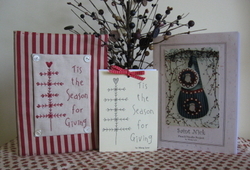 I first saw punch needle demonstrated by Alice and Sally from Kindred Spirits and had to try it straight away. There is a technique to it, but its very quick to master and well worth the effort for the extra dimension it adds to your projects. It is addictive so be warned. I did finish off one other thing this week and that was to get all my tax bits and pieces together and posted off. Not very exciting, but worthy of a big tick. I started this quilt two or three years ago. 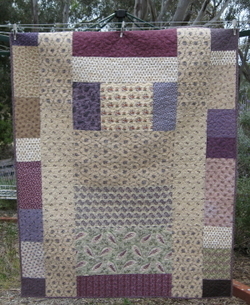 It's called Mary Ellen's 3rd and was designed by Susan Smith, Patchwork on Stonleigh. 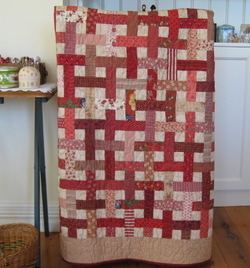 I'd made over half of the little nine patch blocks but wasn't happy with the red fabric I was using. This is one of the reasons why it took so long to finish. 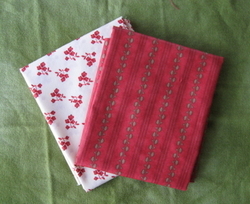 I bought a new piece of red fabric - it was perfect- and finished the top last January. Then it took me another nine months to make the backing. You just can't rush these things. So you will understand why I am so delighted it's finally finished and folded on the end of my bed. The little nine patch blocks found there way into another quilt along with some flying geese I'd made for a zig zag border to go on another quilt. Half way through making the flying geese I realised I don't enjoy making zig zag borders and stopped. This is the second little quilt I made. The first quilt was a birthday present for Bronwyn. I liked hers so much that I had to make one for myself. No more nine patches left but enough flying geese to make two more quilts! I'm just glad I've found a use for some of them. I'm so happy another thing crossed of my list this week. 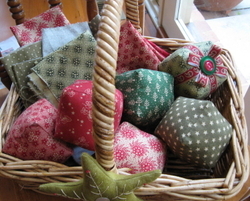 Today, I finally finished the patterns for the Memory Lane workshop in November and posted them off. Yes, I am running a little late with them. I've been asked what the front of my quilt looked like and here it is. I was reluctant to show you as some of you will know that it's not quite finished. 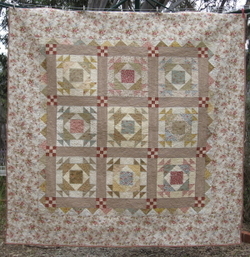 The quilt is called Lucy Charlotte and was designed by Susan Smith, Patchwork on Stonleigh. There should be a row of flowers appliqued across the top and bottom borders. When I purchased the pattern and fabric I had intended to do the applique but I soon realised I had to choose between 'finishing' it or forever having a quilt top waiting in the cupboard. At least now it's finished and it's just right for the 'purple' bedroom my daughter chose a few years ago. Here is one the items I finished and crossed off my to do list during the week. This is the back I pieced together a few weeks ago using fabrics from my stash. Now its bound and finished. Guess what my favourite colour was as a teenager. I remember my lovely mum painting my bedroom mauve, and buying a mauve chenille bedspread and purple dressing gown to match. Now, even though my favourite colour is green and I love reds, I still find myself drawn to the purples. Talking of reds, Friday I had to make a mad dash to Wangaratta, to pick up a sample I had on display at Veronica Violet Stitcheries. 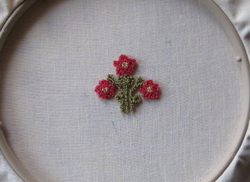 I'd forgotten about my punch needle class on Monday. So Bronwyn, dear friend and neighbour, and Bec, my daughter, came along for the drive. Earlier in the week Bronwyn had bought a lovely new quilt book called Comfort and Joy. Inside she found a beautiful star quilt made in the Roman Holiday range - reds, blues and chocolate browns - her favourite colours. Carolyn has this range of fabric. Bronwyn needed no convincing to make the trip to Wangaratta. 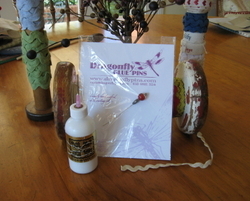 When we got there Carolyn had a lovely gift waiting for me, a Dragonfly Glue Pin, red of course. If you use the Roxanne glue for applique you will know that the syringe applicator can become blocked. The pin is inserted into the syringe and creates a seal. The pins are made by Chris or you can contact Carolyn. Well I have been very busy over the past few days, but haven't managed to cross much of my to do list at all. In fact I wrote a new one this morning. Wasn't game to write due dates against any of the items since most of it is due within the next week. Yesterday, I was teaching a punch needle class at Veronica Violet Stitcheries. Carolyn has just got her website up and running so grab a cuppa and take a visit. I love teaching and don't mind repeating myself as many times as it takes. Which is really lucky because the girls yesterday were enjoying themselves too much to pay any attention to a thing I was saying. I couldn't leave without looking at the fabric. Carolyn has some beautiful fabrics, and limiting my selection to just a couple was difficult (though I did buy 1/2 a metre of each), but I have Christmas on my mind and its RED! After watching the girls start their punch needle projects I was all inspired to come home and make a start on the project for the Memory Lane workshop in November. (Yes, if you were were wondering this is one of the items on the to do list.) I've been thinking about it for quite some time and finally got pen to paper this morning . I started punching it late this afternoon. The leaves still need to be filled in and the shape of the flowers will become more defined once they are outlined and the background filled in. So if you've started a project and been a little disappointed, keep going. It's really important to make sure you outline shapes. The flower centres are outlined with a row of the red to give them a nice circular shape. Next I worked the flower outline and then I filled in. Here's hoping I can have it finished sometime tomorrow so I can cross something of the to do list. Just a quick post to let you know Annette Gero, an antique quilt collector will be featured on The Collectors tonight, ABC 8.00 pm. Last night, I finished sewing the binding on this quilt. Every time the thread ran out I stopped and did my exercises. I only started having problems towards the end. 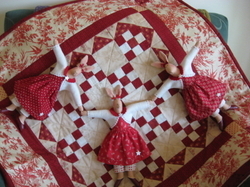 This is the quilt that started my love affair with everything red/cream/white. It's only taken me three years to sew the binding on. 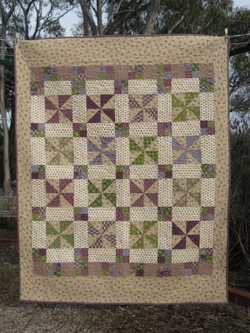 This particular quilt is wonderful for using up large quantities of scraps. I love the fact it's pieced as you go so when the final strip is added the top is finished. It's a great feeling to have finally finished it!